New Proof That December 29, 2000, Not February 9th, 2001, Was the Real Date of the "McQueary Episode"
On February 9th, 2018, I tweeted out the following tidbits to provide (almost) the full documentation for why I, Gary Schultz, Graham Spanier, and Jerry Sandusky are now convinced that the real date of the "Mike McQueary Episode" is December 29, 2000 and NOT February 9th, 2001. Assuming we are correct in this new assessment, it proves that McQueary's entire narrative is a fraud, thus causing the entire case to completely crumble. In 2012, in my first of what would be dozens of conversations with former Penn State President Graham Spanier, he told me many shocking things about Mike McQueary, the man whose infamous/nonsensical testimony brought down numerous good people and caused enormous harm. One of them was that he believed that when McQueary was contacted in late 2010 by investigators, who were trying to finally find some decent evidence against Jerry Sandusky, that Mike did NOT think that was the reason they wanted to speak to him. Yesterday, Glenn Beck's media network devoted, amazingly, over three hours of content based on in-studio appearances by "Framing Paterno" founder John Ziegler. Yesterday the Penn State Board of Trustees unanimously voted Ira Lubert to be its new chairman. On the surface, this would not seem to be a big deal, or even directly related to the fight to restore the legacy of Joe Paterno and get some justice in this fiasco (except, of course, to the insane Second Mile conspiracy nuts,) . But it is indeed significant, and for me it is basically the straw that broke the camel's back. In a bombshell exclusive which will change the way in which this entire story is viewed, “Framing Paterno” has learned the explosive story of an accuser who got a settlement from Penn State for having been abused by Jerry Sandusky, under the orders of Joe Paterno. This accuser, who we will call “VT,” alleges that he was drugged and badly abused by Sandusky during the playing of the 1987 Fiesta Bowl game, which was effectively that year’s “National Championship,” and was won by Penn State over Miami. As anyone who has followed my work on this case knows, the most obvious liar in the entire fiasco is Matt Sandusky. Here is one of several videos I have done indicating why this is the case, which I created after his total meltdown with Oprah Winfrey was ignored by the news media. Editor’s Note: This post focuses almost entirely on people who are obviously public figures in every possible way. However, because of the extreme toxicity of the story, I have gone to extraordinary measures make sure that no new "victims" have been "outed" (they are all already very much in the public record of this case, but the rules for this story are "unique") and that only information needed to verify documents/photos has been divulged. Aaron Fisher is the first, primary, and only accuser (for two years) in the "Penn State Scandal." This past weekend he, his fiancé, and his mother all went on vacation (perhaps to celebrate the third anniversary of the Freeh Report, which has been very lucrative for them). 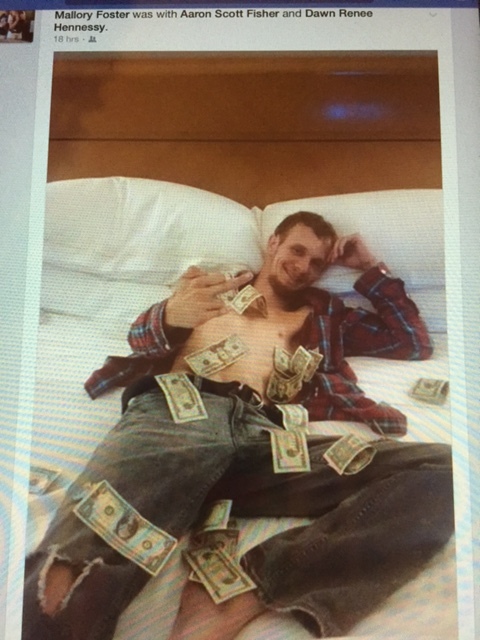 In their hotel room, Aaron posed for a photo which was later posted on Facebook. I have long ago lost count of how many prison letters I have received from Jerry Sandusky (or prisoner KT2386 as he is addressed). He writes so often to so many people that it is obvious that he most always do his very best to conserve all the paper that he can.